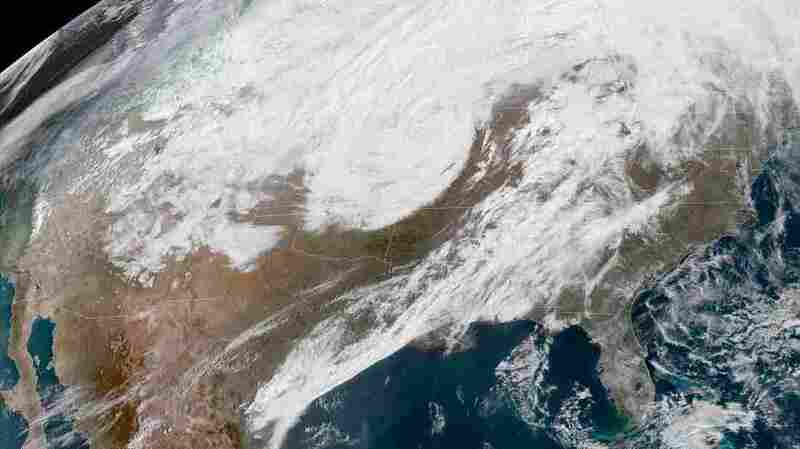 Winter Storm Called A 'Bomb Cyclone' Paralyzes Central U.S. The winter storm has been linked to at least one death, after a Colorado patrolman was struck by a driver who lost control of his car. A massive late winter storm is bringing blizzard conditions to a number of central U.S. states Thursday. In affected areas, many agencies are shutting down and urging people to stay off the roads. An intense winter storm — a "bomb cyclone" of snow and wind — has stranded drivers and shut down interstates in the Rockies and Plains regions of the U.S.
Colorado's National Guard said Thursday that it has now rescued 75 people and two dogs, after checking on 148 vehicles stuck in the storm. The winter storm has been linked to at least one death. The Colorado State Patrol says Cpl. Daniel Groves, 52, died on Interstate 76 after being struck by a Volvo whose driver lost control. Groves had gotten out of his patrol car to check on another vehicle that had slid off the road, police said. Hours earlier, the Colorado State Patrol had reiterated its calls for people to keep off the roads and stay home if at all possible, warning of the risk of accidents. Many state agencies are making that plea again Thursday, with blizzard conditions predicted over parts of Wyoming, Colorado, Nebraska, North and South Dakota and Minnesota. The National Weather Service says the intense weather might have peaked — but isn't letting up yet. "Travel will remain difficult and life threatening across these areas, with improving conditions Thursday night into Friday as the storm pushes farther off to the northeast," the National Weather Service says. "All state offices will be closed today," South Dakota Gov. Kristi Noem announced, citing forecasters' warnings of intense winds. In Sioux Falls, S.D., the eponymous falls were raging Wednesday and Thursday, and floodwaters forced dozens of road closures. The city posted a video of the extensive flooding, urging people to stay away from the high waters. Around midday, Sioux Falls' precipitation was expected to turn from rain to snow — which has already brought perilous conditions to the western part of the state. "Interstate 90 in western South Dakota is closed for more than 200 miles," South Dakota Public Broadcasting's Gary Ellenbolt reports for NPR from the city of Aberdeen. Ellenbolt also quoted Tony Mangan of the state's public safety department, who said, "I mean, if you don't have the snow in parts of the state, you have flooding in the southeast and south central parts. It's best, very honestly, to stay home." 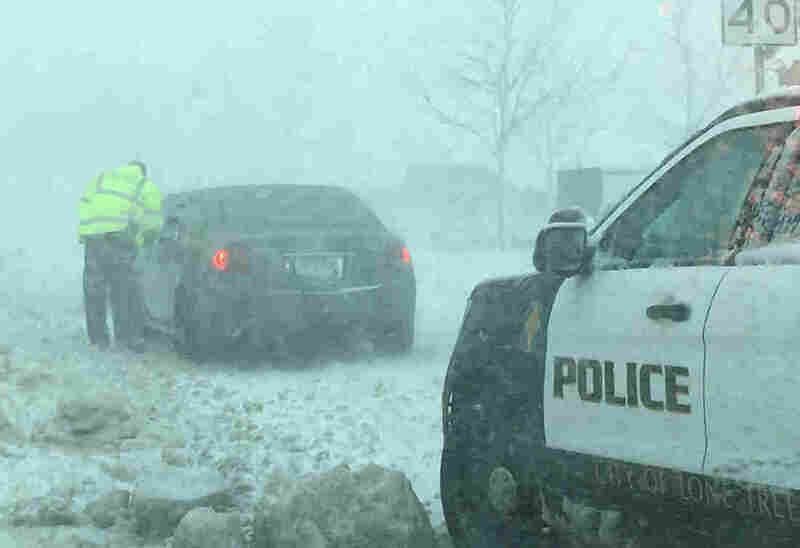 A policeman in Lone Tree, Colo., talks to a driver as snow clogs the towns roads, caught in a later winter storm known as a bomb cyclone. Nebraska, under a state of emergency since Tuesday night, is trying to cope with historic flooding. The state says shelters are currently providing aid to more than 100 people who were forced to evacuate their homes, with shelters open in parts of Nebraska, Iowa and Kansas. The meteorological term "bomb cyclone" refers to a storm that intensifies very quickly, a process called bombogenesis in which barometric pressure falls by at least 24 millibars over 24 hours. That's what happened in parts of the central U.S., where just one day before blizzard conditions hit, many areas such as Denver were enjoying sunny weather in the 50s and 60s. "A bomb cyclone on the East Coast around this time last year killed multiple people, shut down train and plane service and knocked out power to about 2 million people," NPR's Rebecca Hersher reported Wednesday. The current bomb cyclone also whacked part of Texas — including in Amarillo, where high winds shoved a semitruck off a highway Wednesday. Winds also forced the evacuation of the local airport's control tower and knocked out power in the Texas Panhandle and in eastern New Mexico. Areas to the east and south of the bomb cyclone were also facing challenging weather Thursday — with the official start of spring less than a week away. "Heavy rain, snow melt, and ice jams on rivers have produced widespread flooding across the Upper Midwest," federal forecasters said. As the storm moves eastward, it will weaken — but it will still bring risks of high winds, hail and tornadoes to a broad region from the Great Lakes to the South, the National Weather Service says. Parts of Kentucky and Indiana were under tornado warnings Thursday — and one touched down in Union County, Ky., where a motorist recorded video of the twister on his cellphone. Anyone seeking good weather news might want to look toward California, which has finally gotten some good news after enduring tragic weather and climate events, from fires to flooding. As member station KPBS reports, "California is free of drought and only a small amount of territory remains in the lesser condition of abnormal dryness after a very wet winter."